An out of work couple advertise themselves as "Two adventurers. Willing to do anything, go anywhere. No unreasonable offer refused". 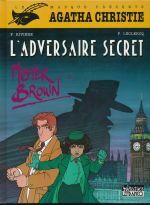 Graphic novel adaptation of the first book in the Tommy and Tuppence series.